Hoyer Petrolog UK is expanding its fleet with the arrival of 89 new MAN trucks. The deliveries, set to complete this October, comprises 75 replacement vehicles plus 14 additional vehicles for recently attained business across. The new additions are all TGS 24.420s tractor units, with 85 being specified with weight-saving day cabs and the other four having sleeper cabs. The deal offers Hoyer a comprehensive fixed price Repair and Maintenance package across a mixture of three and five-year lease agreements. The 24.420s join an existing UK fleet of 500 Hoyer vehicles. Operating nationally across all sites, the new vehicles will be serviced and maintained by the MAN dealer network. 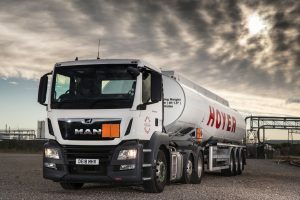 Ian Mclean, Head of International Key Accounts and Special Products, said: “With almost 500 tractor units across the UK, Hoyer is the market leader in fuel distribution. It is fantastic to see MAN vehicles and service underpinning this growth and delivering on Hoyer’s requirements.